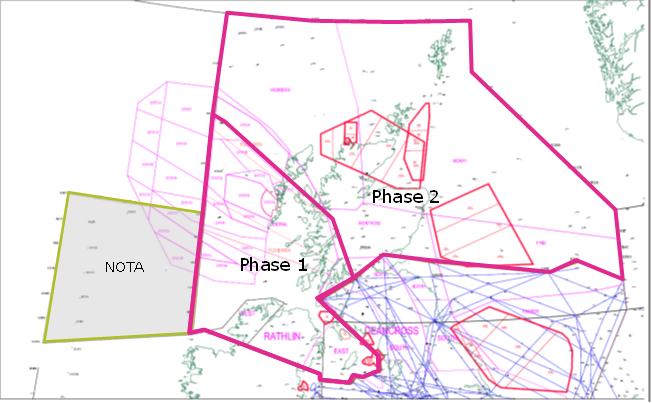 NATS is proposing changes to upper airspace (FL255 and above) in the Scottish UIR and a portion of Irish Airspace where ATS is delegated to Prestwick Centre (Donegal Fillet). The objective of these changes is to remove all ATS routes and establish a portion of the airspace as “Route Free Airspace” (RFA). This will enable aircraft to be able to flight plan and fly direct from point to point. The period of consultation started on 31st January 2014 and closed on 31st March 2014. If the proposal is approved by the CAA, implementation of the airspace change will occur at an appropriate opportunity but, in any event, Phase 1 will not be before September 18th 2014, and Phase 2 not before mid 2016.